NASA's twin Grail spacecraft will crash into the lunar surface intentionally next week, bringing their gravity-mapping mission to a spectacular end. The probes, known as Ebb and Flow, will be commanded to slam into the moon on Dec. 17, NASA officials said Monday (Dec. 10). The agency will host a press conference Thursday (Dec. 13) at 1:30 p.m. EST (1830 GMT) to discuss the impact and the events leading up to it. The $496 million Grail mission — short for Gravity Recovery and Interior Laboratory — launched in September 2011 to map the moon's gravity field in unprecedented detail. Ebb and Flow arrived in orbit around the moon about one year ago — on New Year's Eve and New Year's Day, respectively. The washing-machine-size spacecraft were originally tasked with 90-day science missions, which ran from March to May. But NASA extended Grail, allowing the two probes to gather a trove of additional data. 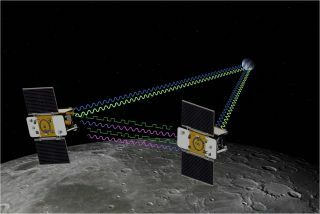 Ebb and Flow have been flying in formation around the moon, detecting the tiny changes in the distance between them caused by lunar mountains, craters and subsurface mass concentrations. Scientists used these ultra-precise measurements to construct an incredibly accurate map of the lunar gravity field. This map, unveiled last week at the fall meeting of the American Geophysical Union in San Francisco, reveals that the moon's crust is almost completely pulverized. The surprising find suggests that the moon and other rocky bodies in the inner solar system were pounded by long-ago impacts far more violently than previously believed, researchers said. The new map was based on data gathered during Grail's original science mission; scientists expect to upgrade it based on measurements the spacecraft made during their extended mission, which brought them even closer to the lunar surface — an average altitude of 14 miles (23 km) as opposed to 34 miles (55 km). Ebb and Flow are now running low on fuel as expected, NASA officials said, so the end is near for the probes. Mission managers will ensure that they go out in style on Dec. 17.